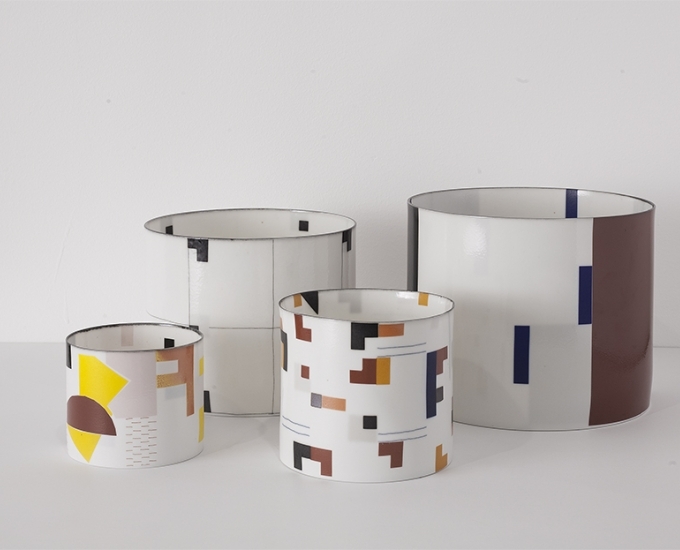 Bodil Manz is a ceramicist known for her predominant use of ultra-thin, translucent eggshell porcelain to create distinctive cylindrical forms, anchored by bold, geometric abstractions in a style evocative of Russian Suprematism. Bodil Manz was born in Copenhagen in 1943. 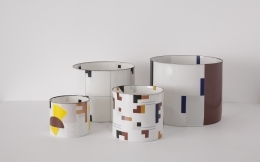 In 1961, Manz studied ceramics at the School of Arts & Craft in Copenhagen, and in 1966 she studied at the Escuelo de Diseno y Artesanias in Mexico and also at Berkeley University in California, USA. Manz established a studio in Horve in 1967, where she lives and continues to work today. Initially creating utilitarian works, such as traditional serving ware, Manz shifted her focus onto the creation of experimental forms in the 1990s. Manz developed a method to create translucent vessels, whereby she would pour liquid porcelain in a thin layer onto a plaster mold, and fire the biscuit several times in succession at temperatures of up to 1300 degrees. 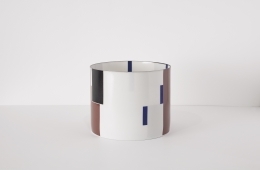 As for the geometric designs that embellish the interior and exterior of her vessels, Manz drafts each composition on paper, which are made into transfers and applied to the surface of the porcelain. These geometric patterns are comprised of bold, tightly composed fields of color. 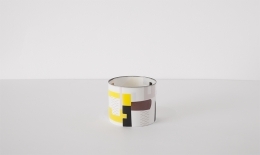 They are dynamic, linear patterns that take inspiration from modernist architecture and painters such as Mondrian and Malevich. The transfers require several consecutive firings to achieve her desired affect. However, Manz notes, she cannot always control the final outcome. 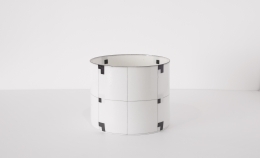 At times, the firing process results in a softening effect upon her initial geometric design. 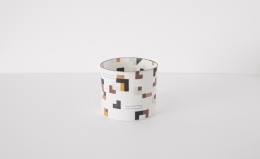 The resultant forms are a wonderful exploration of the multidimensionality of the cylinder. Her attentiveness to the interior and exterior aspects of the form, the applied geometries, and consideration for the way in which light acts upon the opaque and translucent elements of those geometries, not only enhance each of these features individually, but in Manz's attentiveness to their cohesive interaction serves to unify these compositional concepts into a three-dimensional whole. Each vessel Manz creates is unique. Though they vary in size, texture and design, each is executed with the same technical ingenuity, characterized by a tenuous thinness but also balanced and harmonic design elements that can be observed from every angle. And, despite the unconventionality of Manz's creations, each one references the traditional form of the vessel rooted in her arts and craft training. Manz has exhibited in Copenhagen, Brussels, Amsterdam, London and New York. Her vessels are featured in several prestigious public collections including the Museum of Modern Art New York, Victoria and Albert in London, the Los Angeles County Museum of Art, the Musée de Sèvres, France and the Museum of Modern Ceramic Art, Gifu, Japan. In 2006, Manz was awarded the Grand Prize at the 4th World Ceramic Biennale, Korea and in 2008, her works were the subject of a major retrospective at the Kunstindustrimuseet in Copenhagen.